Competition: Tatty Devine & Tilly and the Buttons Giveaway! Fancy bagging the prize? Here’s how to enter: Simply like both Tilly and the Buttons and Tatty Devine on Facebook and comment on Tatty Devine's Facebook competition post with your answer to our question. This competition is now closed. Thank you to everyone who entered and big congratulations to our winner, Hannah Flynn! *The small print: To enter, like both Tatty Devine and Tilly and the Buttons pages on Facebook and comment on the competition post with your answer. 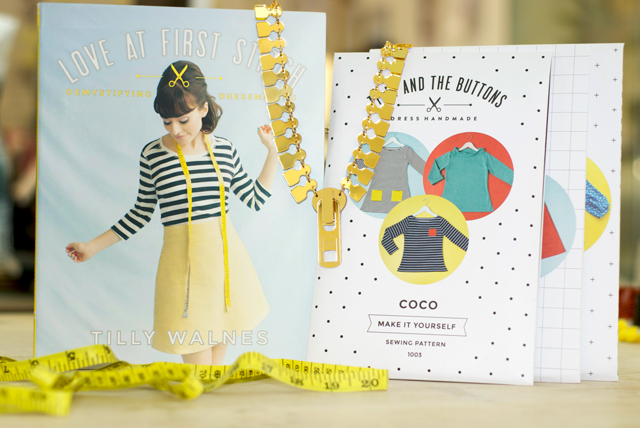 We will randomly select one winner from all comments posted before midnight on 18th September 2014 and the winner will receive one Tatty Devine Zip Necklace, plus one signed copy of Love At First Stitch by Tilly Walnes, one Tilly and the Buttons Coco Sewing Pattern, one Tilly and the Buttons Mathilde Sewing Pattern and one Tilly and the Buttons Miette Sewing Pattern. This competition is not open to Tatty Devine & Tilly and the Buttons employees, their families, agencies or anyone connected with Tatty Devine or Tilly and the Buttons. There is no cash alternative, and your prize is non-negotiable, and not refundable. We will notify the winner via Facebook and on this blog by 1pm on 19th September 2014 and if the prize isn’t claimed within two days of the winner being notified, Tatty Devine will randomly select another winner.